As a hotel philosophy these basic principles are encouraged to help protect our natural resources. 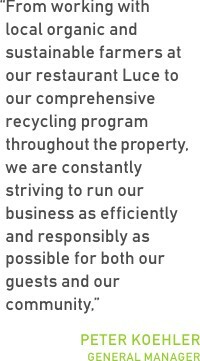 In the InterContinental San Francisco first year a 63% diversion rate was earned through our hotel wide recycling and compost programs. Diversion Rate Average: 74% diversion rate by weight, or a 74% diversion rate by volume throughout the 1st quarter of 2010. Currently, through the 2nd quarter, we ar at 79%, and are targeting an 83% diversion rate by end of the year. This percentage is rapidly rising with ongoing educational campaigns and employee awareness programs. The hotel's eco-friendly paper practices such as electronic transactions, double-sided printing, and email correspondences save thousands of trees annually. We also donate unused amenity products and gently used linens to community non-profit humanitarian organizations. Wherever possible, we reduce water by using china and service ware, cups, glasses, and utensils in all our outlets and the back-of-the-house. In addition, at Luce, InterContinental San Francisco’s Michelin-starred restaurant, we are 100% compliant to San Francisco’s 2007 ban against styrofoam “take-out” containers. We take the commitment a step further by including our back-of-the-house in our NO FOAM policy. We choose 100% renewable energy. The InterContinental San Francisco has partnered with Renewable Choice for Renewable Energy Credits (RECs) and Verified Emission Reductions (VERs), also known as carbon offsets, to reduce environmental impact of our business activities and effectively reduce it with renewable energy and clean tech solutions. In addition to choosing 100% Renewable Energy, the InterContinental San Francisco continually explores more and more ways to tap into alternative energy options. On property, we use solar panels to power our large trash compactor, and use regenerative braking power in our elevators that raises the car and generates power on the way down. Since February of 2010, we successfully raised our Energy Star rating from 64 to 85. It the policy of the hotel that all new purchases of equipment must be Energy Star certified. The InterContinental San Francisco also received rebates from the City of San Francisco's Department of the Environment, and PG&E (Pacific Gas & Electric) of over $120,000 at the end of 2009 signifying a tremendous energy savings from our retro-commissioning process and energy enhancements. We have replaced a very large percentage of regular light bulbs in our hotel with linear and compact fluorescent ones which use 60% less energy. Each bulb saves 150 pounds of carbon dioxide each year. We are fortunate to be working with PG&E and the DOE to test next generaion LED bulbs as a replacement for halogen MR-16's. However, in maintaining the fine balance between conservation and guest satisfaction, we also use a minimal amount of halogen bulbs in some areas of the hotel; most of these lights are powered with dimmers, and operate at 50% power. We have installed .5 GPM low-flow sink faucet aerator for all our guestroom, public, and back-of-the-house bathrooms and restrooms. This saves approximately 30% of restroom water use, without impacting guest experience. It is our promise to conserve water, reduce both energy use and pollutants, by inviting all our guests to contribute by opting for a two-day or more linen refresh program. Our housekeeping records indicate a 41% success rate which reduces the use of electricity, a significant amount of water, and prevents detergent wastage annually. Because of the decreased laundering, the durability of the linens is raised and minimizes the need for frequent replacement, resulting in reduced landfill waste. We also contribute our gently used linens to various in-need community organizations. To date, an estimated average of 50% of our guests opt to participate in the linen reuse program. Thank you! for helping us to be green! Did you know that 20% of the electricity in California is used to pump water around the state? By making it easy for people to cut back on the amount of paper they use during meetings – for example, encouraging them to present information electronically rather than relying on handouts – hotels can help reduce the energy used in paper manufacture. Pulp, paper and paperboard mills account for about 12% of the total manufacturing energy we use in the U.S. We also encourage reusable service ware, filtered non-bottled water service, food waste composting and recycling. All of our meeting rooms feature floor-to-ceiling windows affording an abundance of natural lighting, reducing energy consumption from artificial lighting. Audio-visual equipment from PSAV, our on-site AV providers, are all Energy Star compliant. Our green guestrooms start with your fully recyclable room key card, which is made from 50% recycled and 50% traditional plastic, activates an electronic system in your room. Using special sensors to activate the climate control thermostat, the system adjusts during unoccupied times to a preset energy saving temperature. For our guests’ comfort, the special sensor will detect their re-entry and in moments return to the preferred temperature. This saves thousands of pounds of carbon dioxide being produced each year. Additionally, guests may elect to participate in our environmental sustainability practices by touching the ecoMODE™ green button. This activation of ecoMODE™ relaxes the temperature band by one few degree, which allows for reduced energy consumption while still providing a comfortable environment. The system’s state-of-the-art exterior panel features an electronic “do not disturb” and “please make up room” indicator reducing paper use and a classic doorbell reducing noise pollution in the hallways. The InterContinental San Francisco proudly features Eco Boutique bath amenities, a first of its kind in guest amenities, this luxury collection has been designed for the environmentally conscious hotelier and traveler. Each product is formulated using a blend of organic ingredients and boasts that at least 96% of the ingredients used are natural or of natural origin. The Eco Boutique line uses 100% recycled plastic in its containers. Our guest directories are no longer printed and are accessible digitally through our televisions. Recycle bins are placed in guestrooms, inviting guests to join in yet another opportunity to support our green initiatives. of CFL, fluorescent, and/or sensor-controlled lighting is used to further the efforts to conserve energy. Proper disposal of bulbs are arranged preventing landfill waste and mercury pollution. Our state-of-the art building is made from aluminum panels with weather stripping for climate control and energy conservation. The InterContinental San Francisco is the ideal location for eco-commuters being near the city's major forms of public transportation, such as BART, MUNI, Cable Car, Light Rails and CalTrains. Our discounted commuter programs offer savings to employees reducing travel costs by 30%. To further encourage bike riding and walking, the employee lounges feature showers and lockers for refreshing. We also offer preferential parking rates for hybrid vehicles, and partner with car-share organizations in providing discounted costs for our employees. Currently, we are reviewing design plans to install charging stations for hybrid and electric cars. In addition, the InterContinental San Francisco partners with Bauer 's Intelligent Transportation which offers group transport with a fleet of bio-diesel, EGR (Exhaust Gas Recirculation), propane, and hybrid vehicles. We also feature on "Alternative Transportation" micro site to assist our guests in finding green options to get around the city. Our employees are encouraged to share knowledge of local culture and customs with guests. This helps hotels develop a sense of identity that sits in harmony with the local culture and environment. The InterContinental San Francisco is committed to the ongoing efforts in protecting our environment and continues a series of educational campaigns and employee awareness programs. We also partner with Hospitality Management students at San Francisco State University in our efforts towards LEED® certification. Each department in the hotel accepts interns for extensive training programs. From placing recycling bins in guestrooms and meeting room floors to our Alternative Transportation micro site, we continually search for opportunities to increase awareness with our guests by taking every opportunity to share our practices and invite them to support our commitment towards conservation and protecting the environment.